I suppose it is not surprising that almost as soon I write a post stating what a foliage lover I am, the majority of my subsequent posts feature blooms. In the first place, life is just like that, going along, doing whatever it that it does, despite your best laid plans. In the second place, it is winter, the least exciting time of the year for foliage plants. 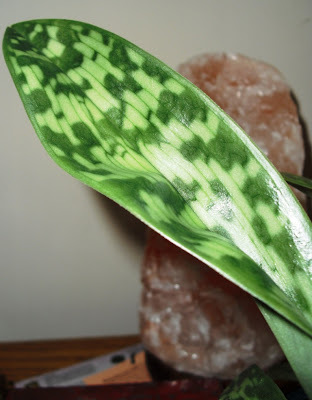 Even if the plants aren't actually dormant, (a popular and erroneous belief about most houseplants in winter) new growth is somewhat curtailed during these dark days. So here is what has been going on among the leaves during the past few days. First, my Paphiopedilum flower has opened fully. According to its tag this is: Paph (makuli-curtisii)-maudiae x maudiae 'Napa Valley' NCC/AOS x sib. I've had this plant since the summer of 2007, when I purchased it in flower. This is the second time it has rebloomed for me. This is a record for me as far as any orchid of any kind is concerned. I've had two different Phalaenopsis rebloom once each and live, and a couple of others die without reblooming. I've had a Dendrobium rebloom once, then die. I've had at least two other Dendrobiums die without blooming. 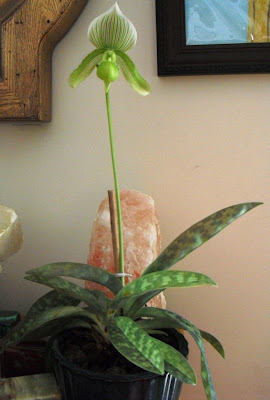 I had another Paph die after blooming. This plant has lived for two and a half years, and has been in bloom three times. I'm psyched. 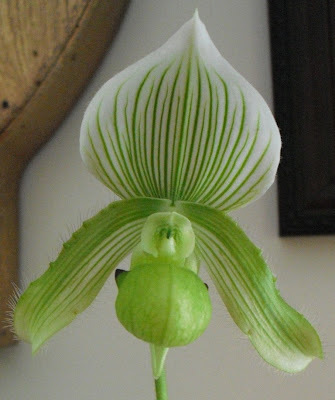 Paphiopedilum leaf, close up. The foliage makes the plant interesting even when not in flower. 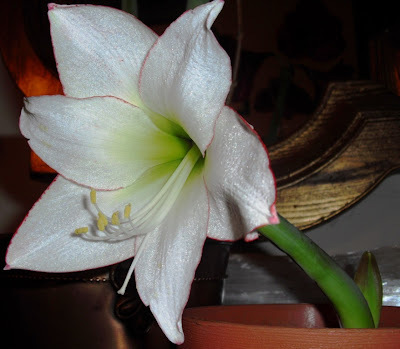 I also have another "Amaryllis" in bloom. 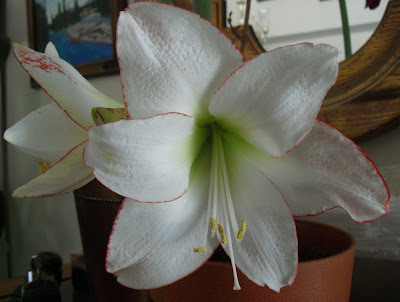 I'm pretty sure that this is Hippeastrum 'Picotee,' even though, as usual, I don't have a tag. Side view. The flower stalk has an injury, which caused it to be fairly short and bent. I'm hoping the new stalk (seen in the rear) doesn't have this problem. I purchased this bulb at the Chicago Botanic Garden's annual bulb sale last fall. Love the Chicago Botanic Garden sales. I can't wait for the orchid show in March!